Just as I published my previous post, news of Charlie Haden's passing was coursing around Twitter, Facebook and the internet. He'd been suffering for the past several years, had stopped playing in public and in the recording studio. His music never lied, whether it was the raucous in-your-face-and-ears approach of the Liberation Music Orchestra or the film noir approach of Quartet West, Charlie Haden was honest. 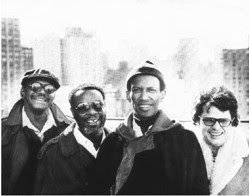 The work he did with Ornette Coleman and Don Cherry in the 1950s and 60s (and the various reunions), his interactions with Keith Jarrett in his 1970's Impulse and ECM groups, Old & New Dreams (pictured left) in the 1980s, the trio with Geri Allen and Paul Motian and so much more, all stood out for its strong music and lack of compromise. Then, of course, the love he had for his family stands out in a world where relationships can be as disposable as paper cups. He started out singing and playing with his family's country & western band in the late 1940s and, in 2008, gathered his children, wife and friends to create a new musical experience along those lines for his "Rambling Boy" record. Charlie Haden walked tall in good times and persevered in bad times, pushing music and ideas out from the rhythm section, not afraid to tell the truth as he saw it. He played with substance, not speed, a full tone and articulated notes, not settling into the background (unless called for). Many Jewish people believe in "tikkun olam", that we are on this earth to promote healing, to help repair what lies broken around us. Though not a Jew, Charlie Haden, through his music and his activism, was just that kind of "repairman" and we were quite lucky to have him in our midst. Wise words, Richard. As one og several 'healed' by Charlie's deep, vibrant tone, universal new sololines and never forgetting the bass' basic role, I aim at living by his motto: "Risk your life for every note". Thank you, Charlie.